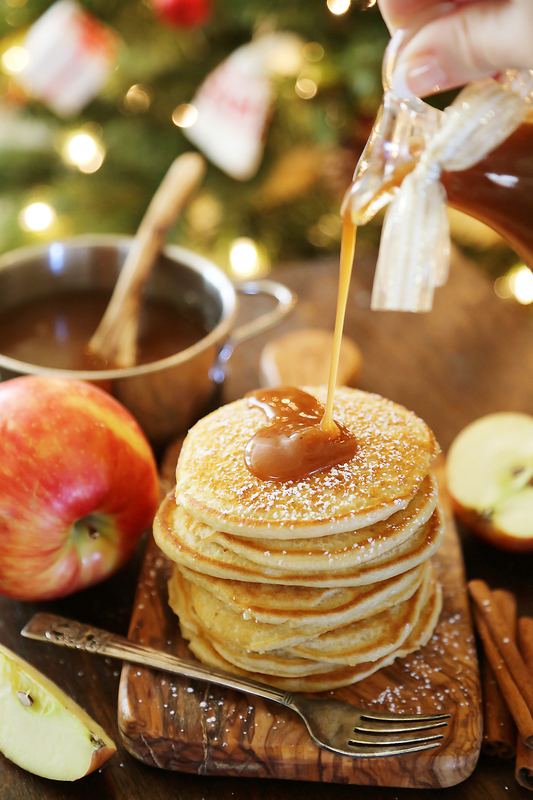 This velvety rich, cinnamon-spiced syrup pairs perfectly with hot pancakes, waffles, French toast, or any recipe that calls for maple syrup. 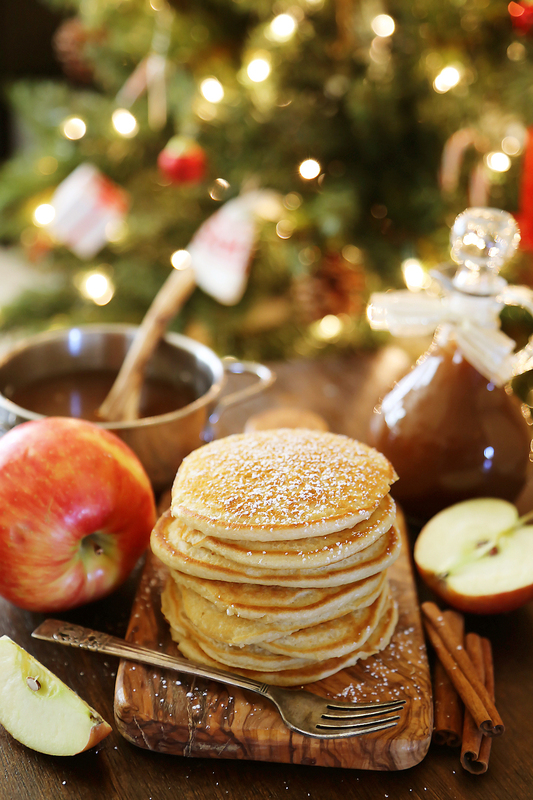 Easy to make for morning indulging or sweet, delicious homemade gift giving! I have some friends who are truly outstanding crafters, and wildly creative with the gifts they create. However, I possess less crafting creativity than anyone I know, and so I turn to homemade gifts from my kitchen instead. Luckily, whipping up tokens of love on my stovetop is one of my favorite chilly day activities. So, while I’m accepting hand knitted scarves and peppermint scented candles, they’re receiving cookie tins, pans stuffed with cinnamon rolls, and mini jugs of homemade apple cider syrup. It’s a good deal we have going. When it comes to gifts from the kitchen, I am all about making sure each one packs amazing flavor. 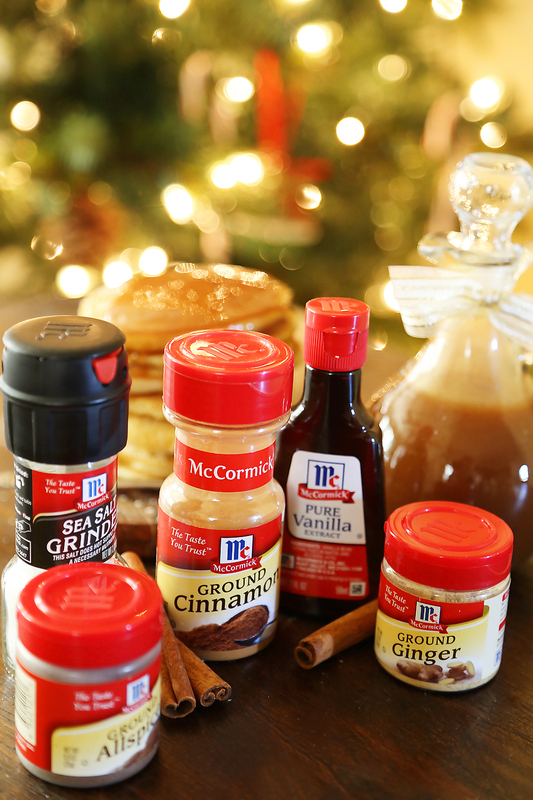 That is why, for everything from apple butter to gingerbread loaves, I am always reaching for McCormick Pure Vanilla Extract and Ground Cinnamon. These two are a marriage made in heaven! I use the warm, inviting flavor of vanilla and cinnamon on an almost-daily basis for mixing in to my daughter’s oatmeal, swirling into Greek yogurt, and baking up loaves of banana bread. The combination is so richly scented and perfect for infusing a little holiday spirit into any homemade sweet treat. For these apple cider syrups, I like to pour them into mini re-sealable glass jars. I tie them up with a pretty ribbon and a little sack of homemade pancake mix. Here is my whole wheat version. It’s the most adorable hostess gift, too. Just add it to a basket lined with a kitchen towel, and any other goodies you think they would enjoy. 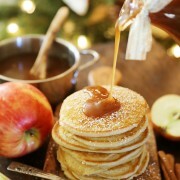 Speaking from experience, I can’t think of anything better to wake up to, the morning after hosting a big holiday event! 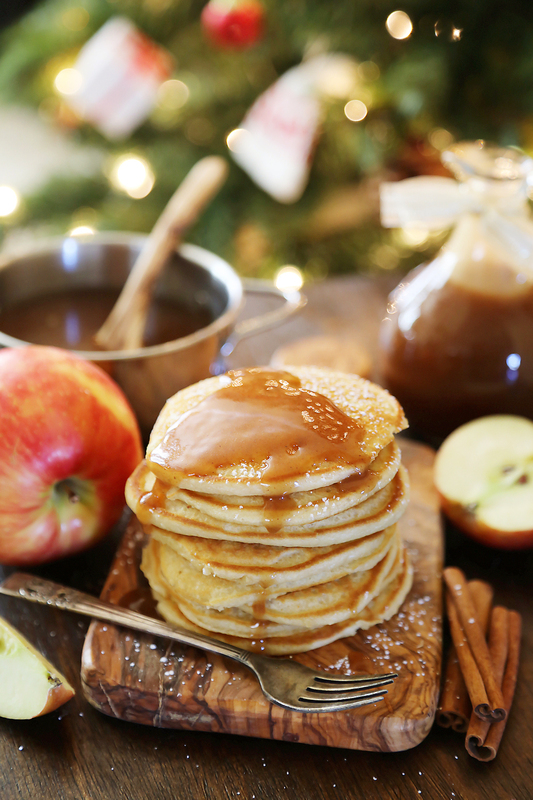 Even if you are just making this for fun weekend experiment, I know you will fall in love with this luscious apple cider syrup! It is so simple to make, and makes the most buttery smooth, scrumptious addition to your morning pancakes, French toast or waffles. You can even try mixing it into a skillet pork chop recipe, too! Whisk brown sugar, cornstarch, cinnamon, allspice, ginger, cloves and salt in a medium saucepan. 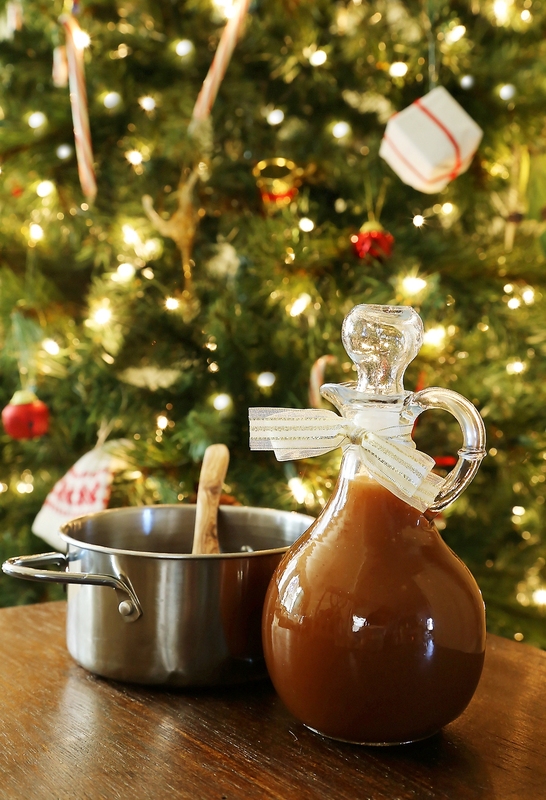 Stir in apple cider and apple cider vinegar. Set saucepan to medium-high heat; bring to a boil, stirring constantly. Boil about 2 minutes, stirring continuously. Remove from heat and stir in butter; let cool. Store in refrigerator in an airtight container. 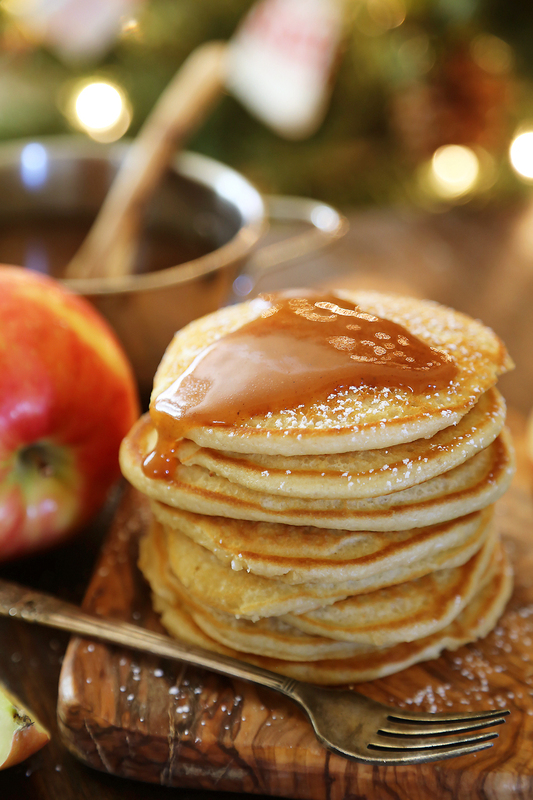 Warm in microwave before serving over your favorite pancakes, waffles, French toast or other sweet breakfast treat. 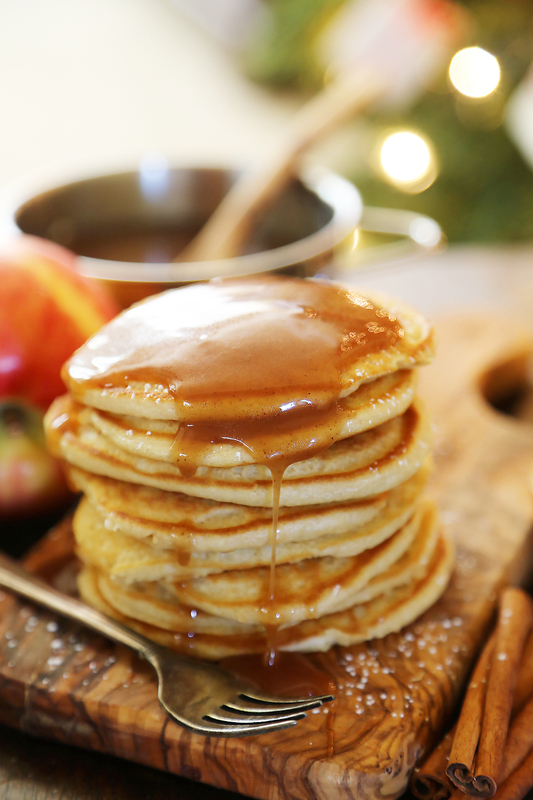 This syrup can be used in any recipe that calls for maple syrup. Disclosure: This is a recipe created for McCormick. I was compensated for my time, however, all opinions are my own. Thanks for the recipe! it sounds so easy! Im sure that all my family will love it for Christmas! Above you mentioned to mix cloves but in the ingredient listing cloves not mentioned. What is the quantity of the cloves to use? Would like the clove amt too. Recipe sounds delightful and easy to put together. Will be another thing to add to all the canned jams and pickled vegetables I gift to special people in my life. Oops, thanks for catching that! The recipe now calls for 1/8 teaspoon ground cloves. Hi, I was wondering if the butter solidifies or separates when refrigerated. What I’m getting at is- can it be served cold and still be pourable? Or should I leave the butter out for that? Thank you! Hi! I’m at work surfing around your blog from my new iphone 3gs! Just wanted to say I love reading your blog and look forward to all your posts! Carry on the outstanding work!